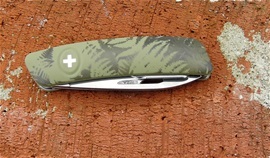 Here is my latest Swiza knife and it is the C04 Silva Khaki. The functions I have shown before on my pages to the left. It is a very cool looking handle scale design that is special. I am very glad for these Swiss products that have high quality. The special blade design and the angle it got from the handle from the hand when gripping increase the cutting strength. The design helps you. This knife is going in my collection. Swiza is a Company that has introduced several camos system and color variations in them. 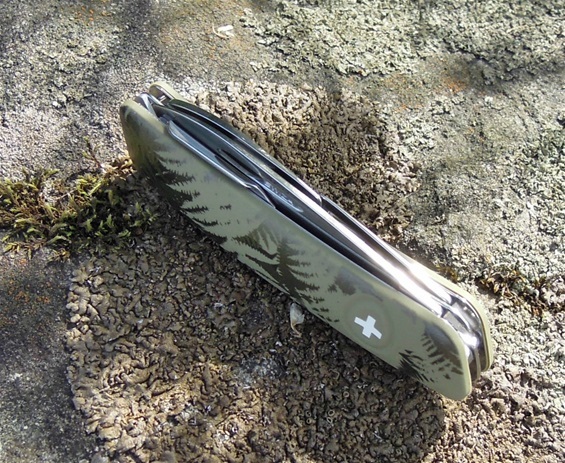 With Swiss knives it is very important to remember; well at least my educated research says that a camo system can be related to people’s personal interests and jobs. It is usually always so that they are made for both worlds. This means in the outdoors or in cities, buildings or anywhere. Some designs are easier to find if you drop it while others can be very difficult to find if you drop it in the same area in the nature that the camo is representing. 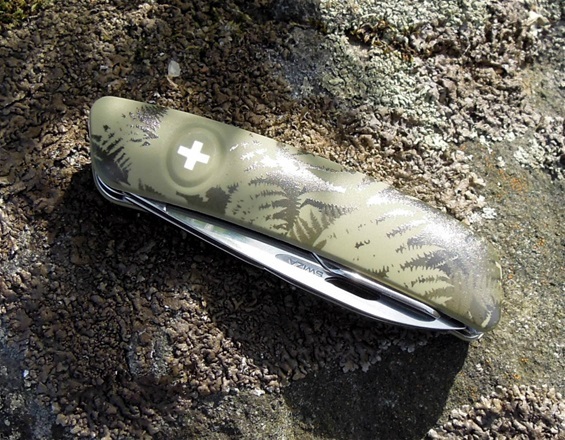 It is normal anyhow that hunters and outdoors people use camo designs for their knives in the nature anyhow. It can be several reasons for this and one can be as simple as having equipment that all are the same. This is for the ability to be stealth for animals or other. 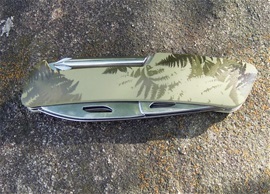 The camo system used on Swiza knives with this configuration represents the Fern Plants. The color shades can have variations. This can be early or withered fern. Some camo colors (orange example)are made to be able to see if you drop it while some colors can actually be to hide it in a very special way. People can see it but color blind deer cannot see it. The green camo fern can have Olive, Khaki or Silva khaki designations. Please feel free to inform if you have any input. When i started to study Swiss Army Knives and Swiss knives it took some time before i analyzed it fully. Swiss knives are extremely well designed to fit the world we live in at the time. This is why we get the evolution of the functions, designs and designations. The Swiss knives are the expert in finding the ability to fit in anywhere. It is the most adaptable versatile knife design ever made. This quality and adaptability makes it famous to be useful in people’s everyday life, jobs and for services anywhere. There are no limits with space included. One thing that I know are very special is peoples EDC choices. A lot of research is used many times to find the best choice for a person with the most needed functions he or she got. It is so interesting to study because in most cases people prefer some extra functions and this I find smart in deed. Swiss knives are known for quality, functionality and design. The Swiza design is the most modern interpretation of the phenomenon. Swiza use several camo designs according to their philosophy and design ideas. Some may wonder how a camo design can be used in the outdoors and the answers to this are many. One them is peoples personal interests and personalizing like I have talked about for many years. It fit just as well in an office as it does in the outdoors anyhow. The Swiza design is a 360 degree design with ergonomic handle scales. They use the soft touch material that is strong and durable. It cannot fracture or chip. The camo systems/designs are applied from what I know so far with a modern high tech method. They are slip resistant but maybe not as slip resistant as the normal white, black and single color handle sides. More than enough anyhow and they are very secure, safe and well made. Swiss knives are educational and the designers are influenced by several aspects. For me it can be to educate myself on the history of knives, the models and the functions. In other words I am interested in every aspect of them. Camouflage designs and systems can have several abilities with the ability to become one part of a hunting dress or part of equipment with a similar philosophy. It can also become personalized or a tool that can reflect personal interests. It is mentioned that “the fern is one of the oldest plants or species of the earth” it is educational. It is always so much extra fun with the Swiss knives because of the depth in the designs and how the functions can follow the world we live in and the demands we have. There is always an evolution in functionality and new inventions. Nice colors and designs can be helpful for the designations and personal EDC choices. Nice colors and designs can become artwork and also be a pause in the hectic life. In a way also a safe refuge and always a tool you can rely on that can save time. For many this knife can be the tool that will be possible to repair with or do maintenance on equipment. One of these functions can be the screwdrivers that can restart an engine or the blade that can cut a seat-belt in an emergency. Swiss knives are the extension of the human mind and hand. With the tools you are your own king and your dedication for the unknown ahead can be the next adventure. The everyday life is an adventure no matter what you do or what place you live.